ELLEN JULIA JAKUBS (nee Slucinskas), age 87. 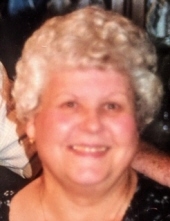 Beloved wife of the late James G. Loving mother of Chris Price (Bill), Jim (Sue) and Kathy. Dear grandmother of Sarah, Kim Tafa (Gjergji) and Lauren. Dear great grandmother of Peyton, Ana and Aleks. Twin sister to the late Eleanor Kuncytes (Frank). Loving aunt of Dennis (deceased)(Sue), Debbie and Darlene Kuncytes; cousin of Marilou Linn. Passed away Tuesday, April 2, 2019. Funeral Mass St. Mark Church, 15800 Montrose Ave, Cleveland, Thursday, April 11, 2019 at 11:00am. Interment Holy Cross Cemetery. Friends may call in the McGORRAY-HANNA FUNERAL HOME OF WESTLAKE, 25620 CENTER RIDGE ROAD ON THURSDAY 9:00 – 10:00am. "Email Address" would like to share the life celebration of ELLEN JULIA JAKUBS. Click on the "link" to go to share a favorite memory or leave a condolence message for the family.